Here is the aggregated information from Internet regarding Joe Flanigan on Collectormania 16. The event happened on May 28-31, 2010 at Milton Keynes, UK. 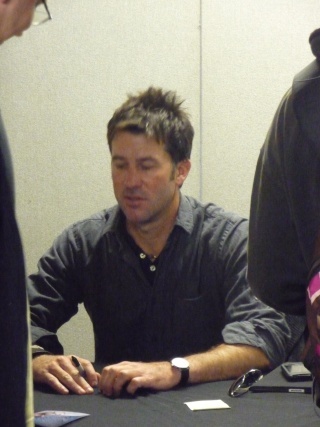 Joe Flanigan was announced as guest at Collectomania 16 for Saturday-Sunday-Monday but appeared there also on Friday signing autographs, as a complete surprise to the fans who were lucky to attend this day. As a consequence, he was not too busy and apparently quite charming and chatty, shook hands, gave occasional hugs & kisses on cheeks. 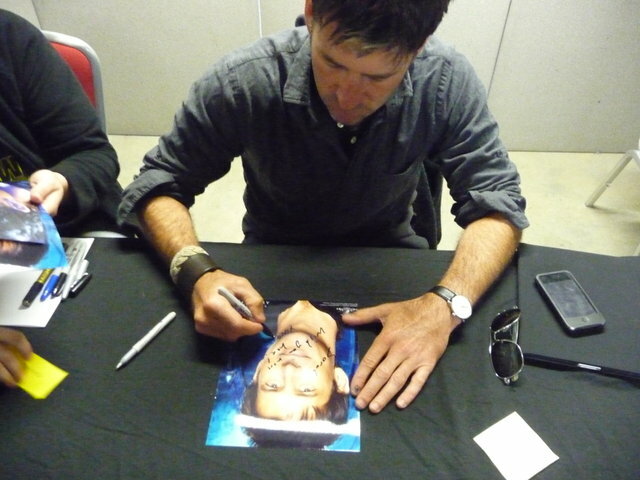 @Sweet_Memories7: Met Joe Flanigan today, a perfect gentleman, funny and handsome too. Don’t get many of them now days. Joe also said … he’d like to be a brontosaurus it’d becool as he could see everything he could be nosy! That was halfway through the convo but he asked me whether we got it in the UK and if I liked it. I’m not a fan of SGU yet but I was trying to be polite b/c it’s part of the franchise and I’m giving it a go. He looked up at me, frowned and I don’t know how to describe it…but yeah, he sounded a wee bit indignant. I suppose it’s b/c SGA and SGU are that different. I don’t know, I think you had to be there to get the effect b/c it’s hard to describe his expression and tone now! Sorry! (Monday) @martinfirrell: Hangover! Too many margaritas with #JoeFlanigan. He had the steak. I had the fish. After the Collectormania event Joe Flanigan headed straight for Costa Bravo (Spain) and then to Morocco. The Flan Info - Sarah Bettles meeting Joe Flanigan at CollectorMania 16 where she presented him for signing a printout of Joe Flanigan Advocacy pages besides her own photo-op. WormholeRiders - CollectorMania 16: R2D2, Daleks, Dinosaurs, Joe Flanigan, Twilight Eclipse (with Promo Trailer)! where the author promised a separate report on Joe Flanigan to follow but none was published as of yet. 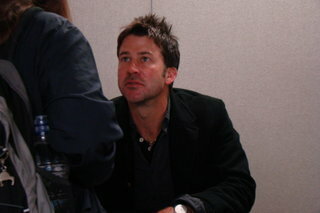 The Flan Info - Charlotte Rodrigues meeting Joe Flanigan at CollectorMania 16 where he talks about considering Twitter and wishing to be cast for a Rockford Files remake. stevie_79 - Back from the dead: a funny story shared with her at Collectormania by Joe Flanigan, involving a fan who sneaked in on him at the Chicago airport when Joe was flying from the USA to get some pictures signed. 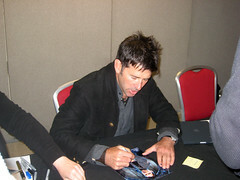 [autorgaphs] Next was Joe Flanigan who plays John Sheppard in Stargate Atlantis. He was chatty and seemed nice spending time talking to everyone. [photo-ops] The final photo shoot was with Joe Flanigan, who was as friendly as ever (much friendlier than the photographer who had a right go at a few of the girls who where working there). 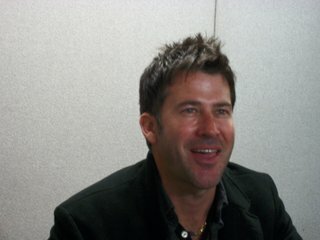 All week-end Joe Flanigan looked apparently quite dashing, clean-shaven, wearing dark costume, first two days, and next two days – an English football 3 Lions west, to many local fans cheering. There are more photo-ops and autographs shared in our Facebook group starting here and click for next. Tweets that registered (this hook was not set up timely, so the log is short). View more leads to my own journal containing a certain portion of the tweets (not all) captured roughly due to which they could not be easily copied over.